He has learned to be be like his “brothers” and get treats before yoga. However, he has seriously limited our eating out unless I get a sitter. His new trick is to move our temporary fence around the pool. He will gnaw on the fence and then push the bricks out of the way. Sometimes he just sits there and you can almost see him thinking of ways to outwit me. I think I have solved the problem (very heavy railroad ties) but I am not willing to leave him alone until I am sure. In answer to Loving Annie and YoBro, here is a current picture of Renny. Eventually, Refined Palate will get back to food. Unfortunately I had to cancel a trip up north and meals at Manresa and French Laundry. Renny comes first at the moment. I did find a number of dog friendly restaurants in Los Angeles and we just might give that a try. For YoBro, I do have 2 other dogs – all from the same breeder, Barbara Page. Update for YoBro. The doggies love steak (the little one can’t have it yet). Life has changed dramatically. The kitchen is basically closed and dining out has been put on hold. For a while, Refined Palate will be on hold. 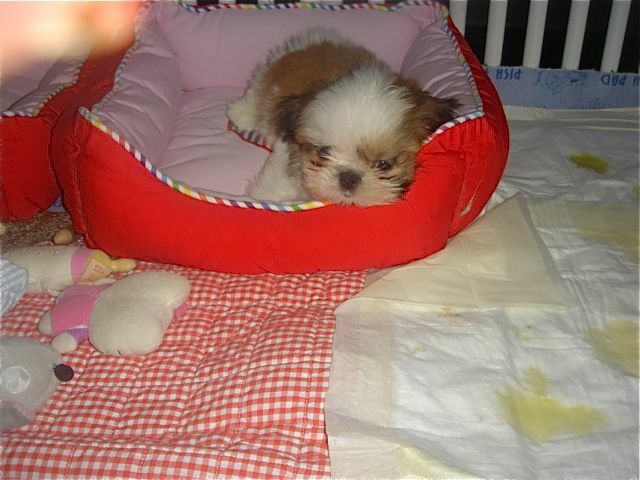 Today, I am going to Pensacola to pick up the newest addition to our family – an adorable 8 week old Shih Tzu. I don’t think you want to read about the horrible food served on Delta Airlines. Not only don’t I want to write about it, I don’t want to eat it.